This model adapter will work for Quicksilver G4s. 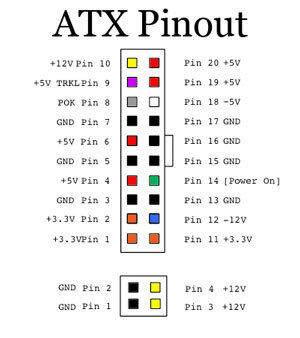 This adapter is the most difficult to make as these systems have non-ATX-compliant power requirements and wiring schemes, plus require a second power adapter for the CPU. Start by cutting the trickle line about 2" from the male connector. Now strip off 3/4" of insulation from each end and tin the wires with solder. For the +12v line, it's easiest if you try to avoid cutting the wire. You'll want to remove the insulation so that the bare wire matches up with the male trickle wire. I carefully strip the insulation off the 12v line using a razor knife. You will also need a spare wire to splice onto the +12v line to use for the second +25v connection on the QS. This results in the G4 getting +5v power when off, just enough to start the system and preserve the memory when in deep sleep. 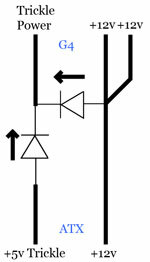 When on, the system received +12v which is used to power Firewire devices. The +12v available to firewire devices is near the lower end of the firewire specification and may not work with every device. The second +12v line is needed by some video cards which use the ADC power connection for additional power. +12v is NOT enough to allow usage of an ADC powered monitor. 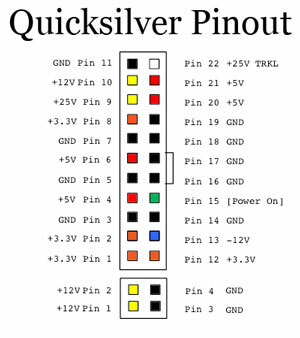 The last part of the Quicksilver adaptation is the CPU power connection. In the PC world, this is referred to as the P4 connector. It's a 4 pin connector with two +12v wires and two grounds. Of course, Apple couldn't use standard wiring, so they reversed the polarity of this connection. 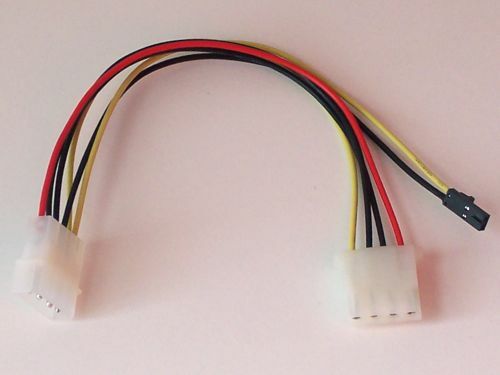 You can buy adapter cables which will convert a spare hard drive molex connector to a P4 connector, or you can use the connector on your power supply if it's long enough, but you will need to reverse the polarity before you use it. I include a CPU power cable with every Quicksilver ATXG4 kit. For convenience, I also include power adapters to use to connect the Apple case fan to the new ATX power supply. This adapter plugs into a normal hard drive power connector and provides a connection to the fan. The adapter has the ends crimped into the molex connector to give a clean look with no unsightly splices.